Over the years, I have come across a fair number of recipes for pork cooked in milk. Pork? Yes. In milk? Yes. I’m not exactly sure of where the technique finds its origins. Italy probably. The esteemed Elizabeth David cites the Veneto in particular, but I’ve also heard Bologna. Naples even. In any case, if you don’t mind flouting several dietary laws at once, this is a pretty awesome way to ring in Spring and celebrate Biblical bounty in a truly transgressive way. Yes, Friends, we are cooking cloven-hooved creatures in milk and honey! A few weeks ago I got an amazing rack of ribs in my CSA share. Serendipitously, the NYT published a series of recipes about roasting ribs in the oven. Meant to be? A secular sign? Though the ribs take a good 2 hours or so to cook, the milk acids make the meat meltingly tender. The milk proteins and sugars create the most delectable crust. It’s like meat lollipops dipped in dulce de leche. It’s not gross, it’s Italian. 1. If you haven’t done so yet, remove the membrane from the back of the rack of ribs. Flip the ribs bone-side up. Using the flat handle of a spoon or a butter knife, loosen the membrane from one end of the rack of ribs. Grasp the loosened end with a paper towel and pull the membrane slowly in the direction of the opposite end. It will probably come off in one piece but if not, you can just grab the torn end and continue. To help visualize, here is a pretty great Youtube how-to clip from BBQTalk. 2. In a small bowl, mix together the oil, rosemary, 2 tablespoons of olive oil, salt and pepper with your fingers. Lay the ribs out on a large sheet of plastic wrap. Rub the mixture all over the ribs. Arrange the ribs on top of the onion halves. Lay the bay leaves on top, and sprinkle the ribs with the red wine vinegar. Wrap the ribs up tightly in plastic wrap and refrigerate them for between 6 to 12 hours. 3. Set the oven to 350°. Remove the ribs about 30 minutes to an hour before roasting. 4. Pour the remaining 2 tablespoons of olive oil into the bottom of a heavy-duty sheet pan. Heat the oil in the oven for about 5 minutes. Add the onion halves and the ribs — rounded side-up — in the pan and roast them for 30 minutes. 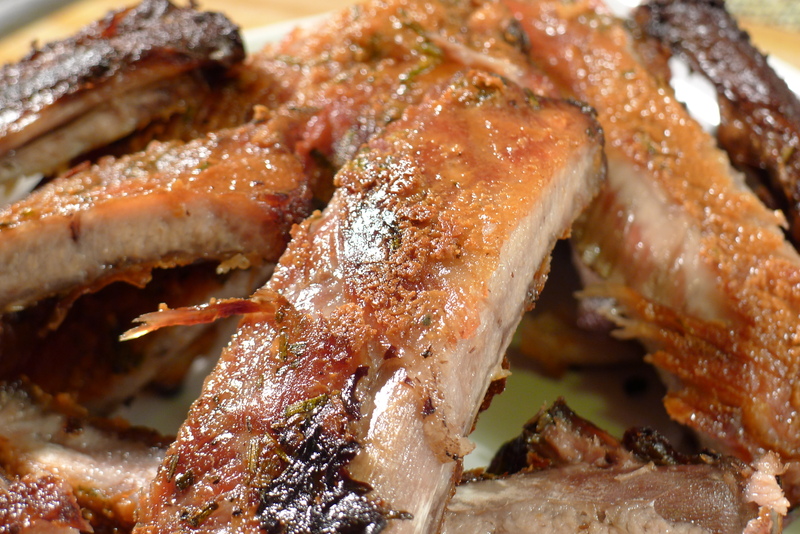 Drizzle the ribs with the honey and roast them for about 10 minutes more. Then, turn the ribs over and pour the milk and cream over them. Roast the ribs for another hour. After an hour, if you notice that the ribs are starting to brown too much, cover them with a sheet of parchment paper or aluminum foil. Continue to cook them for another 30 minutes to an hour more until they are tender enough for you to be able to pull the ribs apart with your fingers. 5. Remove the ribs from the oven and let them rest on a cutting board for about 5 to 10 minutes. Cut the ribs into sections and serve immediately. It’s not gross, it’s Italian…. that’s the funniest thing I’ve read today! Great post and recipe. I’m making these right now. The house smells divine. May I ask why you changed the quantities of sage, rosemary and honey from what was given in the NYT recipe? Thanks! Thanks for the message! I’m glad to hear that your home smells yummy. I think that I changed the amounts of the herbs required because the quantity seemed so excessive. 3/4 cup of rosemary + 3/4 cup of sage = a whopping 1 1/2 cups of herbs! It seemed like a lot, especially for such strong flavors like rosemary and sage. So, I changed it so that I could taste the meat more and the herbs less. I also ran out of both honey and sage when I made them. I know! But the ribs seemed so great even without the sage and the extra honey that I ended up not minding at all. Please do let me know how yours turned out!